Despite the fact that we can’t agree on exactly how to spell it, whiskey (‘whisky’, in Canada, Japan and the U.K.) remains one of the most strictly defined categories of alcohol on the planet. Broadly speaking, it is a grain-based spirit, distilled at lower proofs to retain those flavors, and aged in wood casks. But if it’s bourbon, those casks are of unused American oak, and that grain is more than half corn. If it’s single malt Scotch, it remained in oak for at least three years, and that grain can only be malted barley. Steeped in tradition, these rules are about as likely to change as Newton’s law of gravity. All this is to say: making the stuff leaves little wiggle room for experimentation. Yet modern consumers constantly crave something new and next. To slake that thirst, today’s whiskey makers are arriving at increasingly innovative workarounds. Here are just some of the ways they’re bending the rules and widening the category in the process. Whiskey begins its life as grain — a loosely defined ingredient. Historically, though, this has been interpreted to mean the cereal grains: corn, barley, rye and wheat. Virtually every whiskey on shelves today owes its recipe to some combination of the four. It follows that tweaking these building blocks could widen the variance of any resulting liquids. Yet it’s not something that most whiskey makers ever consider. Westland Distillery challenged the norm when they opened in 2010 in Seattle, Washington. In southern Arizona, Hamilton Distillers is smoking its own malt with mesquite to add a new dimension of flavor. The native wood introduces regional idiosyncrasies atop a familiar foundation. “Our goal is to use the classic Scotch style of whiskey-making as a blank palate to create very unique flavors that represent the terroir of Tucson,” says Dale Riggins, manager of the brand. Though the release (Del Bac Dorado) is gentle in its smokiness, the distillery is preparing a seasonal variation this winter which amplifies those subtleties. For generations, Scotch has been brought to maturity in barrels previously used to hold bourbon, port or sherry. Bowmore, however, has opted to wheel in wine casks for its newly-minted Vintner’s Trilogy. The 26-year-old release spent half its life in French oak, which once carried Grand Cru Bordeaux. As a result, you taste sultans and Christmas spice, which McCallum likens to the Yule Log. “Oak is a pure wood and it has these three actions: it removes unwanted flavors, it adds desirable flavors, and it acts in harmony with the spirit to create new flavors in the cask.” It is that third element that these new experiments are highlighting in dramatic ways. In Ireland, Tullamore D.E.W. — a brand with nearly two centuries of history — is tapping into its country’s proud past to help sculpt its drinking future. Once one of the biggest apple producers in the world, the emerald isle was as much associated with cider as it was with brown spirit. Tullamore’s Cider Cask expression combines the best of both. 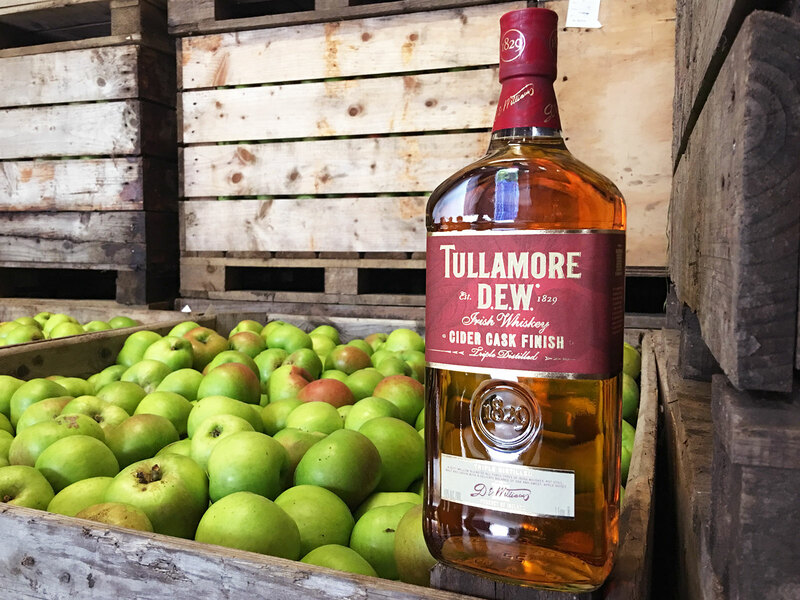 “We press Irish apples and season our whiskey casks with apple juice,” explains Tim Herlihy, brand ambassador. “The barrel is seasoned for three months before we then remove the cider, and finish our Irish whiskey in cider seasoned barrels for three [more] months.” The half-year process wraps the liquid in a bright, slightly tart embrace. Adds Herlihy: “Cider has always paired well with the green apple notes of [our whiskey].” Now they sit together in the same bottle. Yet for all this modern innovation, well-established brands are careful not to stray too far from their core identity. Woodford Reserve, as a prime example, has toyed with specialty releases for over a decade in its Masters Collection. But master distiller Chris Morris had to first define what his original whiskey was. “Before you can innovate, you must have a standard against which all experiments are compared to,” he contends. “In other words, you need a baseline.” Whether he’s finishing his bourbon in brandy or pinot noir barrels, substituting white corn for standard variety, or smoking his grain with cherrywood, you still have a good sense that it’s Woodford Reserve when you’re drinking it. The philosophy is echoed on either side of the pond: “The most important thing if you’re buying a bottle of whisky is you should recognize it,” declares McCallum. “I’m all for experimenting, but I’m 100% adamant that when you buy a product it should be what you expect in the bottle. In fact, it should be better than you expect. Because we only change things when we think we can make it better.” If the inventive distillers of today hold themselves to such a standard, we can look forward to whiskies that aren’t just new, but next level. A flavorful future awaits.